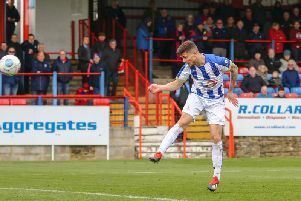 Hartlepool United travel to Maidenhead United to play at York Road on Saturday – but what can they expect from the National League's fifth from bottom side? Pools will be looking to end a poor run of form - which has seen them go on a run of seven consecutive National League defeats. It may be difficult to predict the type of opponent they'll come up against on Saturday. Maidenhead have gone through a range of different results in recent weeks – including 6-0 and 7-0 defeats but also an away win at promotion chasing Sutton United. What system will Maidenhead United play? Maidenhead tend to stick with the traditional 4-4-2 formation, going with a hold-up type striker alongside a pacey forward who can run in behind. They have an experienced defence at this level - however Pools should fancy their chances given their recent heavy defeats. Who are Maidenhead United's key players? Former Pools loanee Ryan Bird is a key man upfront for The Magpies and they also possess a consistent goalscorer in midfield in Adrian Clifton, who has six National League goals so far this season. Maidenhead also have an exciting product in their academy with Josh Kelly with the 19-year-old bagging five goals as we approach the season's midway point. The Magpies will also rely on their captain Alan Massey at centre-back to provide the experience and a platform to move up the pitch. Do Maidenhead have any injury worries? Maidenhead come in to the game with no fresh injury concerns - leaving a full squad to choose from. Who is the Maidenhead manager and what can we expect from them? Magpies manager is Alan Devonshire, who returned to the club for his second spell as manager in May 2015. He is a manager who seems to enjoy attacking football and has enjoyed great success in his second spell at the club. His achievements include promotion to the National League in 2017 before guiding the club to a top-half finish in their first season in non-league's top-flight. What form have Maidenhead been in? Maidenhead have only won one of their last nine National League games, conceding 24 goals in the process. They have won four points in their last three games and will be looking to build on that against Pools.